The administrators of HMV have said that the music and DVD retailer will start accepting gift vouchers in stores from Tuesday. Deloitte had previously said that gift cards could not be redeemed in stores, leading to anger among many customers. Deloitte said it was able to honour the vouchers after assessing HMV's financial position. Meanwhile, restructuring specialist Hilco has emerged as the frontrunner to save HMV, reports say. Deloitte said that money raised from the sale of charity releases would also be paid in full, while it continued to try and find a buyer for the music chain. "We will continue to assess the longer term options for the business whilst continuing to trade," it said. "[We are] hopeful this process will result in the business continuing as a going concern." An industry consortium of music labels and film studios, including Universal Music and Sony, are believed to favour Hilco, according to newspaper reports. Hilco bought out HMV Canada from parent HMV group in 2011 for £2m. Deloitte, HMV's administrator, has said there are 50 separate groups or individuals who have expressed an interest in buying all, or part of HMV. 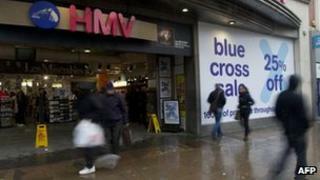 If Hilco is successful with its bid, the suppliers are believed to be willing to give HMV stores generous credit terms. In Canada, Hilco said the support of HMV's key suppliers had been of "critical importance" to the business's performance. The music, DVD and games retailer went into administration last Tuesday. Hilco was not immediately available to comment.